An Chapel Koth is a beautiful 18th century Cornish cottage which has benefited from a modern renovation. Situated just a few metres from St. Keverne village square which boasts a convenience store, family owned quality butcher, an excellent organic restaurant and 2 local pubs serving a variety of good food. Coverack beach and harbour are approximately two miles away, while country footpaths lead to Porthallow, the half-way point on the Southwest coast path. An Chapel Koth is ideally positioned for enjoying village life or exploring the coast and countryside of The Lizard peninsula, Helford river and further afield. Entering the cottage through an outside lobby area leads you unexpectedly into a cosy, beamed, open-plan kitchen, lounge and dining area. The lounge features an inglenook fireplace with a wood burning stove and has modern and comfortable furniture. The lounge leads to a separate sitting room with a flat screen TV and Freeview. The compact, well-equipped kitchen has an electric oven and 4-ring hob, microwave and adequate storage space. Leading from the kitchen area is a utility room which includes a fridge & small freezer, dishwasher and a washing dryer. There is a downstairs cloakroom off the utility room and the cottage also has modern storage heaters. On the first floor are three good size bedrooms. Bedroom one is a large room with super king bed, bedroom two is a good size double room. 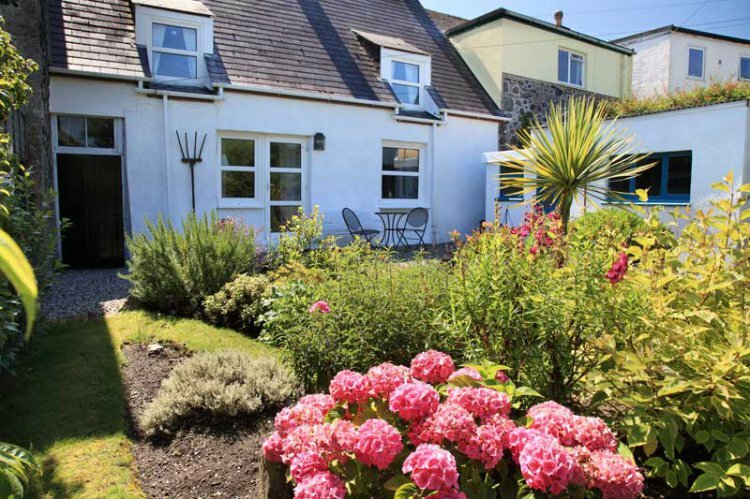 Both overlook the well laid out garden and have distant sea views of Falmouth Bay. An optional third bedroom provides two single beds on request and is subject to a supplemental charge (bearing in mind the property is set up for a maximum of four persons) please call to enquire. All rooms benefit from original features with modern decoration and bedding. The family bathroom has a free-standing roll top bath, matching toilet and handbasin, heated towel rail shaver point, and a separate shower cubicle. Outside, An Chapel Koth provides a large, well maintained private garden that is ideal for relaxing in and barbecues on summer evenings. There is plenty of on-road parking and parking is also available in the village square. No smoking in property please. Porthoustock and Porthallow beaches are close by along with the popular harbour village of Coverack and the Helford River. There are plenty of walks including a walk along a meandering stream and wooded valley to Porthoustock. There are also many beautiful gardens to visit within the local area.